"The Boat Show," a thematic group exhibit in multiple media. Main Floor Gallery, Studio Place Arts, Barre. Through April 12. Although boats and ships are essentially just vehicles to transport humans and cargo through water, they hold a special - and often metaphoric - place in our imaginations. Hence "The Boat Show," currently at Studio Place Arts in Barre, artistically plies the maritime motif with 40 artworks by 27 artists from around Vermont and as far away as the West Coast. Aptly named curator Janet Van Fleet organized the exhibition into loosely related groups according to theme. Among them: boats at night, disasters at sea, and what she calls "the journey to the next world." That such clear-cut categories emerged from the material, Van Fleet writes in a curator's statement, "makes me realize that we are tapping into a universal theme . . . with different artists riffing on it, each in their own fashion." Janet Fredericks has supplied ethereal paintings of the journey-to-the-next-world kind. Her 110-by-42-inch "Sacred Cargo" is a long, mixed-media work on paper depicting a boat that seems suitable for conveying a soul to the spirit realm. Fredericks used both drawing media and acrylic paint in creating the reddish-brown earth tones of the piece. 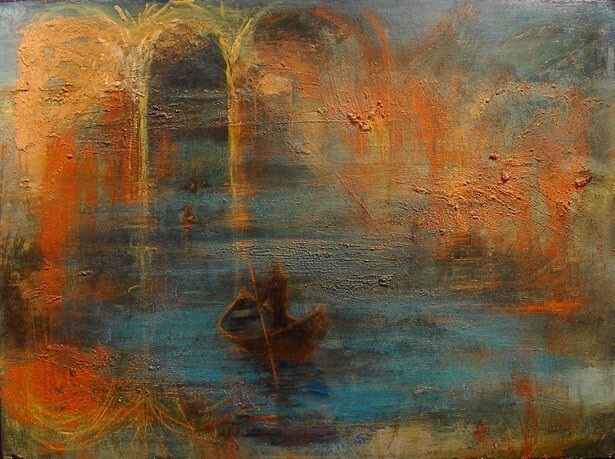 In her 22-by-30-inch "Between Earth and Water," dated 1995, a boatman as mysterious as Charon - the ferryman of Greek mythology who brought passengers on one-way trips to Hades - steers a dark vessel through a textural, atmospheric blue and red-orange background. Strange arches in the distance beg the question: Is this a view of Venice, or a more metaphysical scene? The painting's title and mood suggest the latter. Michael Heffernan's three 12-by-14-inch collages of a foundering sailboat convey an ironically playful narrative. Their titles are "Disaster at Sea - High Seas"; "Disaster at Sea - Breaking Up"; and "To the Depths." The sails of Heffernan's geometric, childlike boats are made from snippets of a picture of "The Raft of the Medusa," an epic disaster-at-sea masterpiece by Théodore Géricault (1791-1824). Heffernan's flat patterning for waves and sky appear in festive aqua, light blues and orange. His astute use of the Géricault lends the images a dire yet satiric edge. Dorothy Martinez' 14-by-14-inch sailboat painting entitled "Dream" appears in the "boats at night" group. Like Heffernan's, her vessel is also a bit childlike, with a simple orange hull and a white sail. It floats in a dreamy chartreuse background over a band of churning, black-and-white "sea," which runs along the lower edge of the picture plane. A patch of cerulean blue at one edge of the picture suggests the green mist is about to break up. Several fascinating sculptural pieces barged into this show. Some of the most delightful appear in a single entry entitled "Migration - Transport Series," by Danielle Bodine of Clinton, Washington. Her petite armada consists of nine 12-inch, papier-mâché boats that look like little kayaks. Installed on wires about 6 inches off the wall, each vessel is stuffed with various fibers or organic objects such as seeds, and stain-painted in muted hues. A kayak is also referenced in Lian Brehm's "Boat with Walrus Image." The 32-inch, vertically wall-mounted abstract kayak has seven sticks lying horizontally over the graceful shape; a pattern ostensibly made of walrus bones appears underneath the sticks. The form is as elegant as it is mysterious. Though it was not originally intended as a work of art, Plainfield boat builder Bill Moulton's 15-foot-long "Cosine Wherry Boat," installed in the middle of the gallery, has a commanding presence. The sleek rowboat is made from cedar strips and is an impressive, beautiful craft. In the context of "The Boat Show," it becomes an elegant piece of sculpture. This thematic SPA exhibit will sail into the sunset on April 12.